In the "Files & Folders" select Ask for Finder Items and drag it. 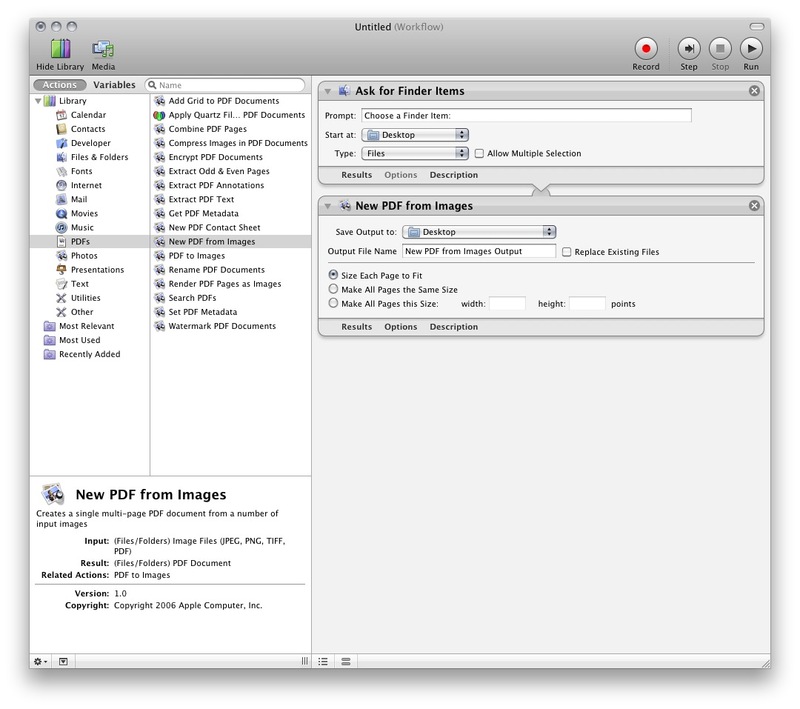 In the PDFs Category, find "New PDF from Images" and also drag it. When you're satisfied with your Workflow, click "Run" on the top right corner. Watch the magic happens and depending upon the number of items and your CPU power, you might go grab a coffee/tea. Of course ImageMagick also works on other Unix systems, and even on cygwin. I don't know if this works with .jpg files but the easiest way I know to convert text is to select print in the file menu, then in the lower left of the print menu select save as PDF. Not the answer you're looking for? Browse other questions tagged mac pdf file-conversion . How can I convert 100 photos into a pdf thats less than 6 MB?